CONTENTS: BounceBack – Naloxone Toolkit – Campus Mental Health – Mood Walks – Implementing Quality Improvement Across Ontario – HSJCC Secretariat – Talk Today – Living Life to the Full, and more. CONTENTS: Supporting the Mental Health and Addictions Leadership Advisory Council – HSJCC Secretariat – ODSP Policies – Mental Health Accomodation – Policy Consultations – Campus Mental Health – Talk Today – Mental Health Week – Living Life to the Full – Mood Walks, and more. CONTENTS: Mental Health and Addictions Leadership Council – Police Records Check Reform Act – Refugee Mental Health – the success of numerous programs and initiatives, including the Centre for Innovation in Campus Mental Health, the Excellence through Quality Improvement Project, Mental Health Works, and more. 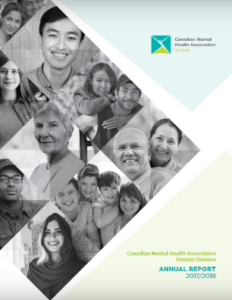 CONTENTS: Details from the CMHA Ontario Division Conference – Provincial Policy Achievements – the success of numerous programs and initiatives, including Talk Today, Living Life to the Full for Older Adults, Mood Walks, and more. CONTENTS: A Message from Our CEO – A Message from Our Board President – Treasurer’s Report – Statement of Revenue & Expenses – Statement of Financial Position – Revenue by Source – Expenditure by Program – Board of Directors & Advisory Council – Contact Information. CONTENTS: Message from the Board President – Mental Health Works – Fundraising – Policy and Public Issues – Branch Support – Knowledge Transfer – 7th Annual CMHA Ontario Achievement Awards – Treasurer’s Report – Financial Statements. CONTENTS: Message from the Board President – Mental Health Works – Policy and Public Issues – Knowledge Transfer – Branch Capacity – Fundraising – CMHA Ontario Achievement Awards – Treasurer’s Report – Financial Statements. CONTENTS: Message from the Board President – Mental Health Works – Mental Health Tune Up 2004 – Making Gains Conference 2004 – Knowledge Transfer – Policy Research and Advocacy – Fundraising – CMHA Ontario Achievement Awards – Treasurer’s Report – Financial Statements.